Cotta with round neckline and taper sleeves is typical for noblemen of the XII-XIII centuries. It is decorated with contrast thread on the neckline and sleeves. 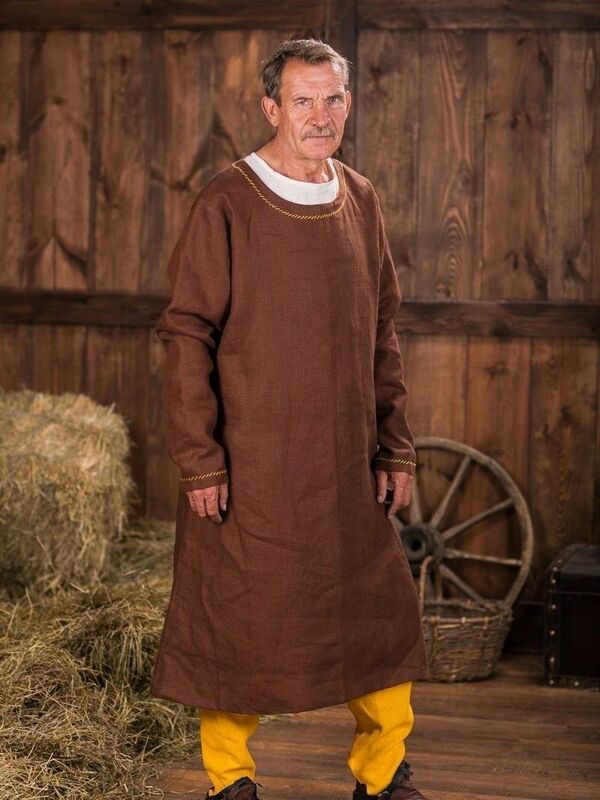 Undershirt and chausses will be perfect addition to this medieval cotta. Lining will make your cotta more comfortable. Long beautiful dress with lacing on the elbow and wrist line of sleeves has laso drawstrings on the back, that allows you to fir the dress on the figure. Besides the trim on the bosom, bottom hem and sleeves, the dress is decorated with a design, that is laid out with a contrast lace. Together with short coat, this dress creates tender and romantic image. Only 100% natural fabrics are being used for manufacturing. Different colours are available for order. .. 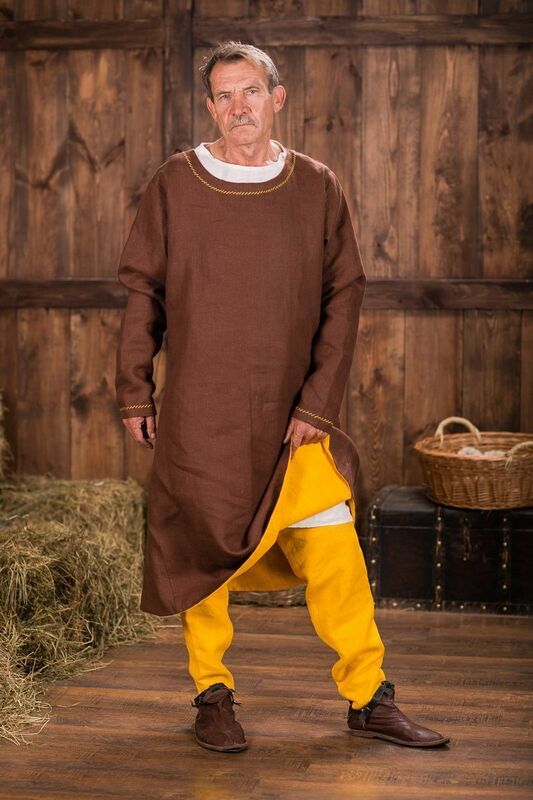 Historically correct set of medieval men's underwear includes: - simple shirt; - pants (braies) with strings on the waist and legs; - cap. All parts of set are made of 100% natural materials and can be orded separately. We sew it of white or natural coloured cotton or linen. If you wish other colour, please contact us at [email protected] .. In Europe of X-XIII centuries the shirt was always extremely necessary to create a full-fledged knight costume. 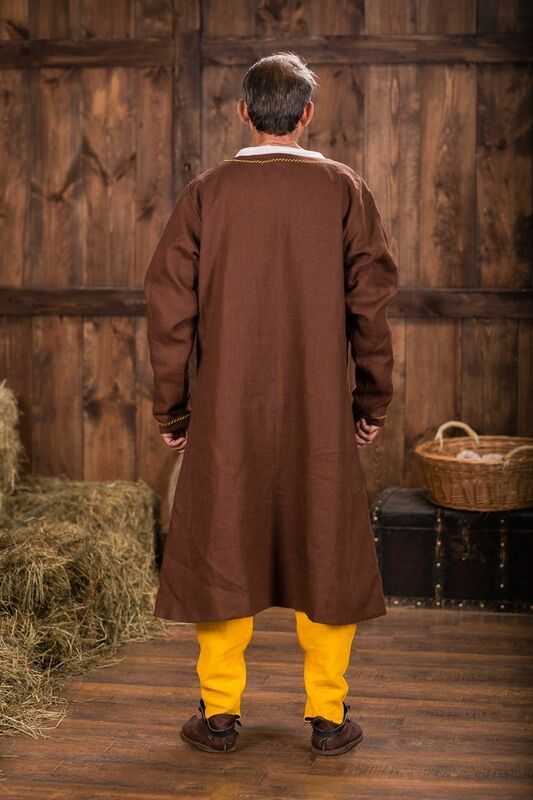 Many other items of clothing, such as tunic, gambeson and different armour could be put on over it. This model is different due to its wide sleeves, which are also, like the neck, marked with colorful applique. The shirt is being made of 100% natural fabrics: linen, cotton, wool, velvet or silk. Different colours are available for order. Please send the wished colour of applique to [email protected] ..
Sleveless knee-lengh cotta is edged with a trim and fastened with buttons to the waist level. Together with shirt and pants, cotta can create especial character of fantasy-style warrior. You can order this model in any colour, made of linen/cotton/wool/silk/leather. The price does not include a belt. .. Typical features of men's cotardie are tight fit and a lot of buttons. This model of cotardie is made according to the historically correct patterns. It has stand-up collar, 10 buttons from the front and 6 buttons on each sleeve for fastening. There is cotardie with lining of contrast colour on the photo. The lining makes your cotardie not only beautiful, but also very comfortable and hard-wearing. Base price includes cotradie with lining made of cotton. You may also choose linen as lining fabric in options. Long or short chausses witll be a great addition to the cotardie. Please choose the main colour in options, and send the wished colour of lining to us [email protected] The metal buttons could be different from the option picture. ..